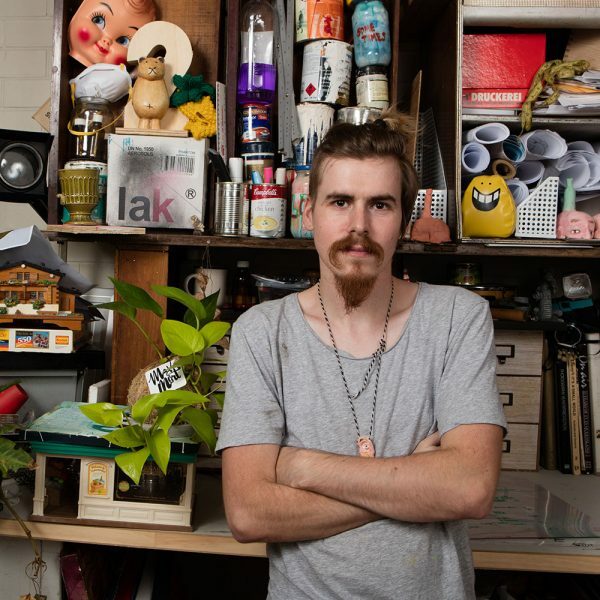 His works were created within the previous months as he discovered himself and what he liked to draw in the Day-to-Day Living art workshops at Brisbane Youth Service. I heard about Brisbane Youth Service through a friend who suggested I see them for support around housing. I had been living in my car and couch surfing for three to four years and I couldn’t get a house or job and it was stressful. I went into a boarding house after receiving housing support from BYS. I was living in New Farm and had a lot of time to myself. That’s how I started coming into BYS’s Day-to-Day Living art workshops. I was later transferred into a BYS one bedroom unit. My art kept changing and evolving. There was a sense of belonging in the art workshops. And escape. It was a big escape from life and everything. It was homely. I knew I changed but I didn’t know I was changing. pride, and the pride makes you want to achieve more and work harder. When I saw it (the art) all up on the wall I discovered I had a colour and style. The opening night just made me feel in place, gave me a sense of self-worth. Visible Ink* has helped me too. They helped me build my community group which links artists with other artists and services, and a place to socialize. We meet weekly and are doing an art show together at the end of the year. I’ve become patient and I’m responsible for myself now. Believing in myself helped. Right now I believe I can do something, whereas before I had self-doubt and no confidence. The mindfulness workshops facilitated by Footprints* in partnership with the Day- to-Day Living Program were really handy. You’ve got to practice them, not just walk away. I’ve also learnt to be grateful. Gratefulness is a huge one. I’m grateful for all the help I have had and that I have a roof over my head that I can afford. It has allowed me to move forward. pride, and the pride makes you want to achieve more and work harder.